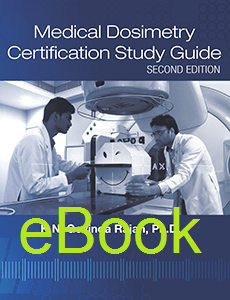 One of the best study guides for the Medical Dosimetry Certification Board (MDCB) exam is Govinda Rajan’s book. Now the expanded second edition of this popular guide is even better, with twice as many questions as in the first edition. The guide focuses on the MDCB exam’s “big three” areas of treatment planning, radiation physics, and dose calculation. Other sections of the study guide cover localization, brachytherapy, radiation protection, and quality assurance. Many questions include helpful full-color figures and detailed explanations from one of the world foremost authorities. Read a "Free Chapter" for a sampling of the contents in this new edition!